I enjoyed my second Walk Across Lake Winnebago this past weekend, so I want to share a set of pictures and reflections from the walk. I am someone who loves Wisconsin and winter enough that I started a blog to convince people to appreciate the beauty and fun we can have here during winter, so this is the kind of inspiring event I want people to use as a model! (I also have written about last year’s Walk, and the history of the Walk.) As the above photo suggests, the view from the opening leg is exciting. Seeing a long line of people, snaking across the path ahead, makes one feel part of something big! These are the kind of sights that one might capture during a variety of kinds of experience out on the ice. But it helps to have special events like this to bring a lot of people out here, to have the chance to look! I love to watch for the strange patterns that can be formed in the ice. Most of what I saw, when looking at the nature around the walk, were sights like the preceding one. Snow that extends so far away… that it is a bit hard to wrap one’s head around the immensity of it. Snow that extends so far, human vision can only capture so much of it before it blurs into a white haze curving away… and then, above it, a distant shoreline. I spent more time viewing images like the one to the left, though. 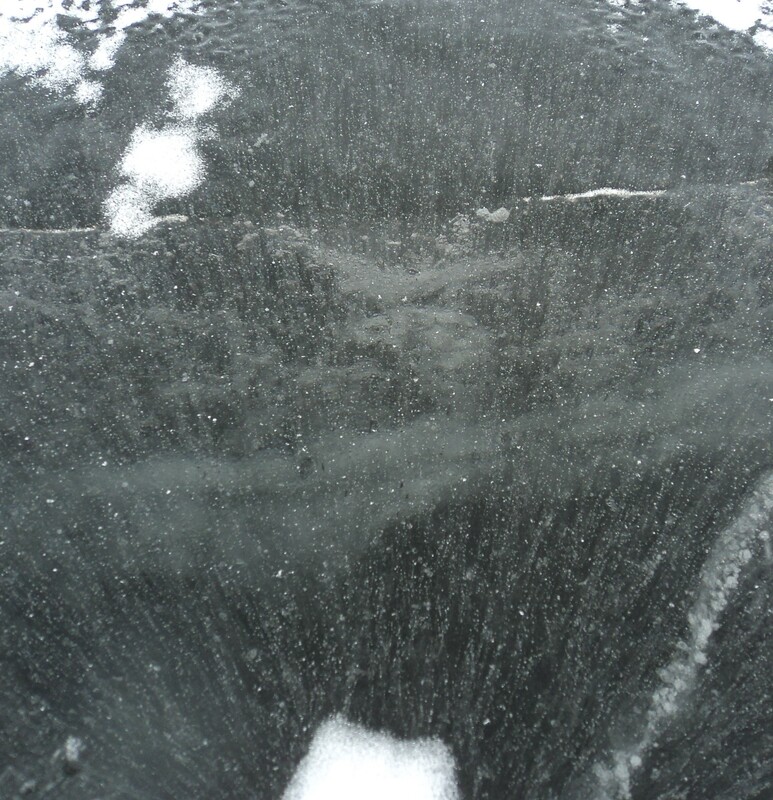 When you walk on ice, its important to safely keep an eye on what you’re walking on! 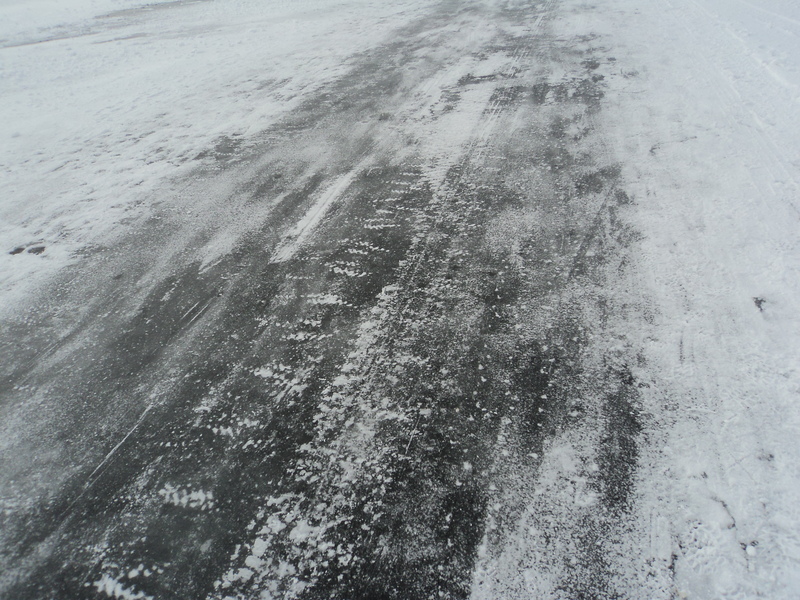 The road across the ice – plowed, driven over, and then walked over by hundreds – had patches of exposed ice, but usually one could find a sweet spot of packed snow to walk in along the side. 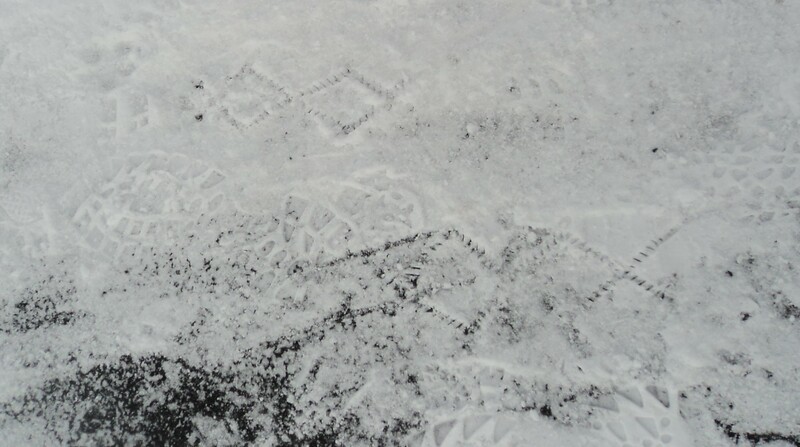 I got familiar at spotting the tracks of what one could use to help grip the ice – particularly the crisscrossing marks left by Yaktrax brand ice-traction devices people add to their shoes. One marks the distance in part by watching for landmarks. There is a regular set of old Christmas trees marking the road, giving a sense of one’s progress. More notably, there will periodically be areas with a mix of tables trucks and more, breakpoints where a group has gathered. More prosaic than Brigadoon, but equally lively, is the key temporary hamlet, Apple Pie Ville. (And don’t worry folks, it may be gone… but even larger numbers will soon be on the ice, for sturgeon spearing season…) As a blogger who plays tribute to the outdoors in winter, I tend to focus on images of nature – but for most participants, this is largely a chance for community fun. And this stop in the middle is a highlight! At Apple Pie Ville, the supplies are brought by truck, but others find different ways to haul items. On the left, we see an example of a rare but regular practice – pulling a sled’s worth of supplies across the ice. 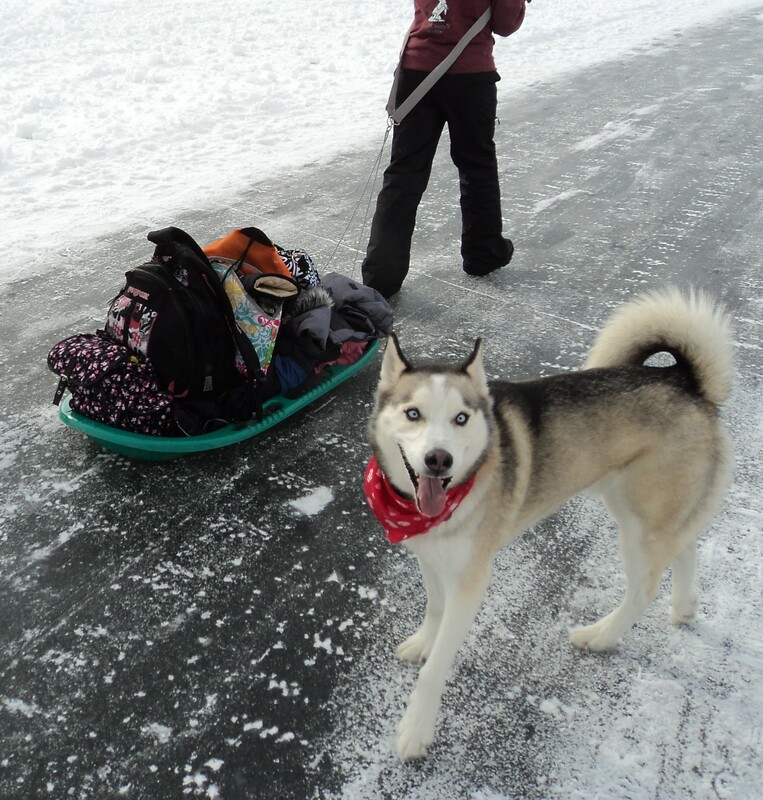 On the right, a bike used to pull a supply sled, by bikers spreading good cheer on their way across the ice! This year’s event paid tribute to one of the Walk’s strongest supporters, David Kohler. Kohler, an animal lover who helped the Walk raise a lot of funds for the Shelter, passed away in September 2014. Part of the charm of an event like this is seeing all the ways people find to make the ice feel homey – and to entertain themselves. Walkers and non-walkers alike come to hang out for a hours. 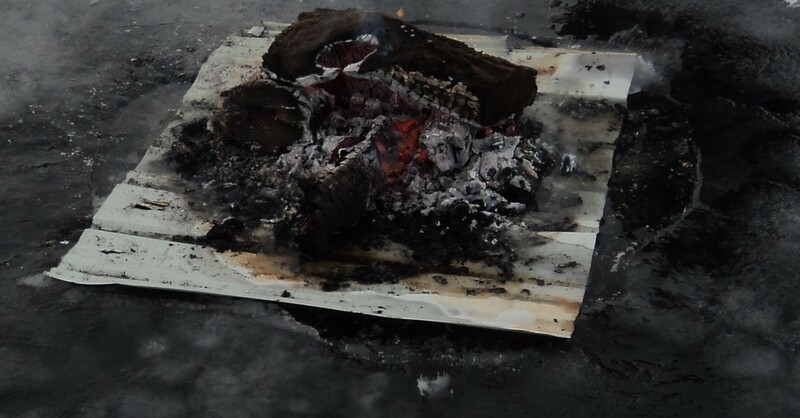 So yes, someone had a fire out on the ice. New for this year, one could buy pizza on the ice. In the modern world, one can call ahead, while walking across a frozen lake, to order pizza being cooked elsewhere on the ice… its a strange world, when you think about it! Some who joined the event got an impressive workout – bikers and runners (pictured) who crossed the lake both ways. But most of us just went one-way, and took a reasonably paced, but fairly leisurely, pace for the ten miles we covered. In some ways, what is weird about the event is how… ordinary it feels. From the conversations I had, or overheard, I got the sense that this was not a group who came out primarily out of a desire to study nature, or to engage in some extreme exercise. These were people who largely live in the area, and were taking the chance to come together in a local public space; people who were having everyday social conversations, while on a social walk together. And quite a range of people – Stacy Frakes told me that walkers in past years have ranged from a 2nd-grader all the way to a woman of around 80 years. It is easy to feel part of a community enjoying being active. The most common comment organizers hear is ‘you end up walking with different people, people you’ve never met before’ – it brings the lake community together. It just so happens that this community meets up miles out on the ice! I wish we had more such social walks! Why not get out and walk around the public natural areas in our communities with our neighbors more often? More promenading! Perhaps that can be a means for communities in other parts of the state find ways to appreciate what the public nature around them has to offer? Part of the fun for me, as someone who loves viewing winter nature at a slow pace, and taking pictures of it, is finding out what kind of immersive experiences I can have; what does it feel like when I stop and take in the fact that I’m in the middle of a 215 square mile lake? And what intriguing perspectives can I capture from the walk; for instance, what do viewers think when they look at the above photo? What does it help us see about ice? Lake Winnebago is a special place, one that provides a unique sort of opportunity which this walk takes advantage of. An event like this, involving the vistas one can look over, and involving a long safe walk through the wilderness, could not be held in most locations. But lakes have traditionally been considered public spaces in Wisconsin, so when a lake temporarily becomes a solid surface, it opens up a space for hosting an event such as this. Winter may be cold, but I hope we in Wisconsin appreciate how fortunate we are to have a combination of nature which the public can access, and below-freezing weather, which enables people in places like the Winnebago area (and other lake communities) to take advantage of the situation; to visit an outdoor commons and enjoy ourselves there! Last weekend saw the biggest snowstorm of the season in Milwaukee. As usual, I wanted to get out and enjoy the pleasures that snow can provide while falling! 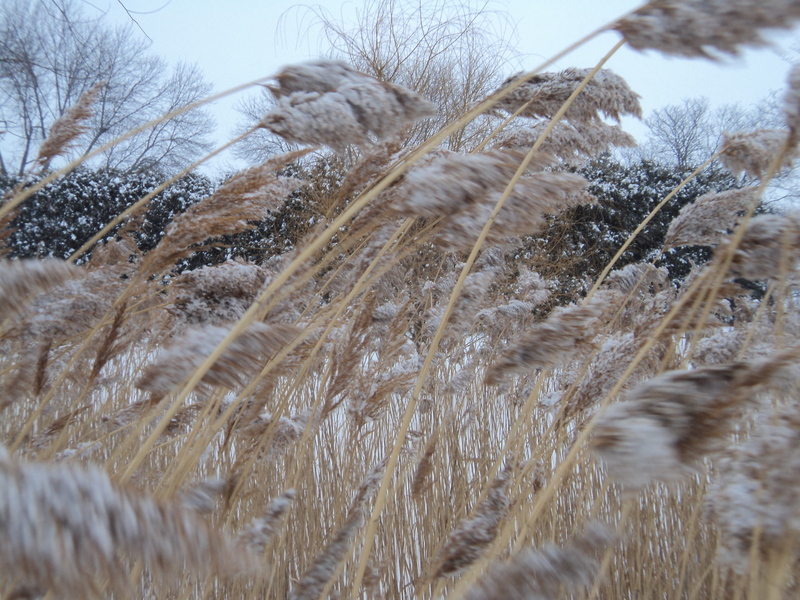 Then, I went out afterwards to see how snow and wind had reshaped the landscape. 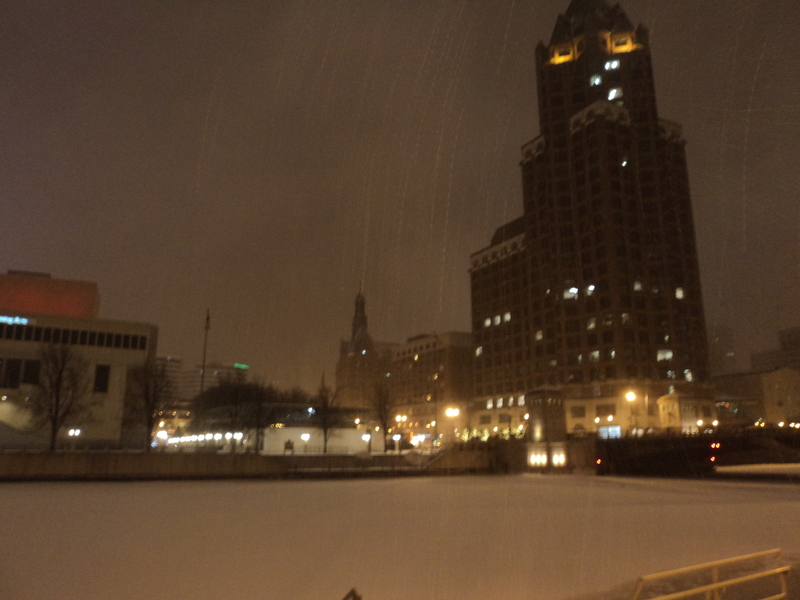 Walking downtown, I had the chance to feel amidst both the wildness of snow, and the dramatic forms of some of the larger buildings in Milwaukee. 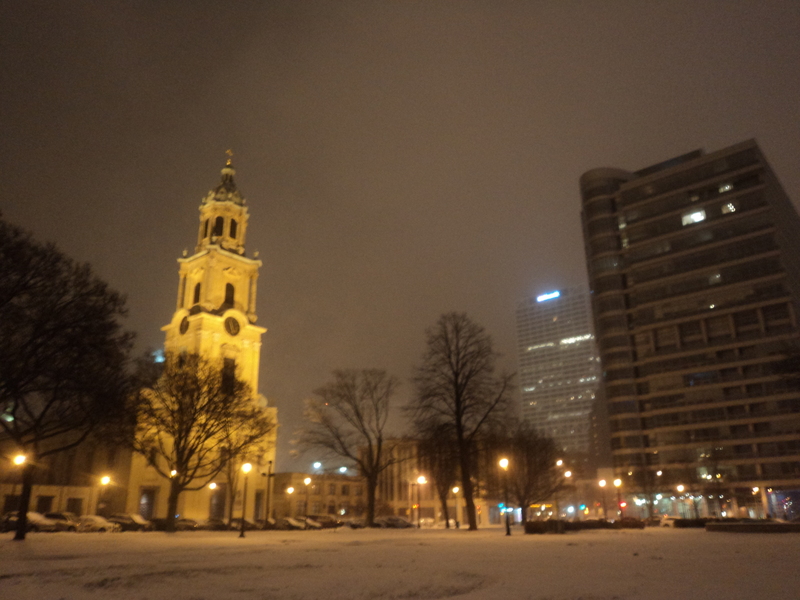 A lot of history and design, a lot of snow visible in the air. I enjoy taking a look at landmarks with snow also as part of the scene. What gets blurred in the distance? How can one feel encased in a kind of limited-snow-globe-world, where after a certain point, all that appears to exist is a wall of snowy blur? It was also fun to see others out in the snow, including a surprising-to-me number of bikers. One stab at capturing the feel of the falling snow, the lights of buildings, and the amusing interplay between lights and snow…. Sometimes, I play with the abstractions that a camera shot can produce. 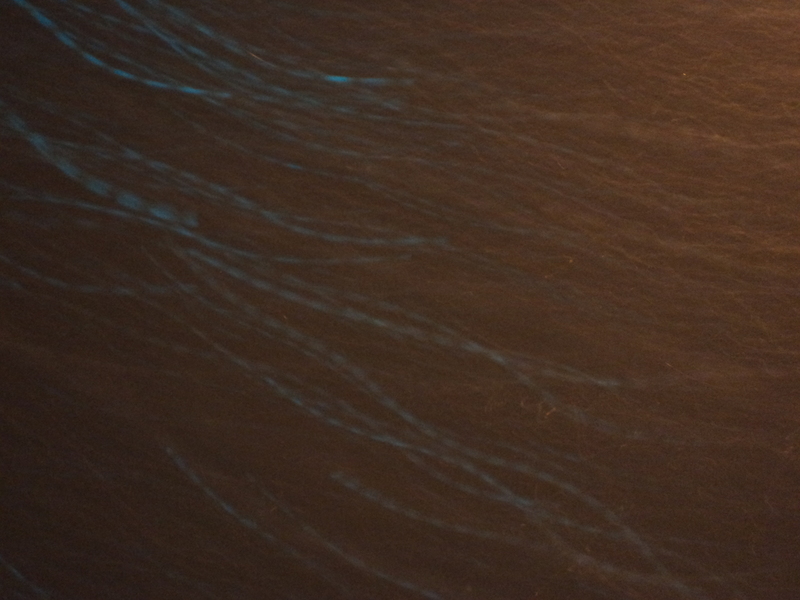 How to recapture what it looks like to see streams of color as snow passes by a stoplight? Well, here’s one possibility. This image plays more with flash effects. I’d never see an image quite like this, I admit, but I like how it captures the sense of a place flooded with snow. A blurry experience. Vision is limited, it is skewed, it varies as the wind shifts. I think this image presents that aspect; glows, fuzzy, low light, but bright lights pierce through. Whenever I see light in winter – moon, sun, street – I look for the sharp play of shadows on the boldly white snow. How do patterns intersect, as tree shadows fall across drift patterns, with their subtle abstractions and tiny shadows? The next day, as the sun rose, this combination of patterns was even sharper. Remember that you can find such drift patterns in all kinds of places. Wherever there’s a yard with trees on it. Or in this case – at the rest area off the highway near Lomira! This stunning glimpse at the intricacy of drift patterns also came from that rest area. The scale doesn’t need to be great to find how wind can whip subtle changes in elevation, and who knows what else into a surprising variety of elegance. And these patterns might soon change, so take a glimpse at the patterns each day brings. Then, to finish where I started… another way to envision the movement of the storm. The grasses (and the trees behind them) have fresh accumulation from the snow. They also are pulled around, bent over, by the wind. Again – get outside, look around at various objects in the landscape, and let me know what you find! The blizzard can truly only be experienced from within, but it is still fun to focus one’s attention on aspects of it that one can remember later. To encourage gratitude for winter, it is helpful to check out some of the most interesting events we can find, and to share thoughtful reflections on how we can find beauty and solace during the season. I share articles regularly on my Facebook page (and kudos to the Winter Cities Institute for doing so as well); late January feels like a good time to renew our winter love by revisiting highlights from what I’ve read so far this winter. To start off, Alena Hall identified some great ways in which snow can help us find joy, including wonder, relaxation, and links to childhood memories. A good motivational piece to fire us up to remember what winter has to offer! To value both winter and one’s community, it helps to be open to identifying what we have to enjoy. For example, Minnesotans have recently been taking more self-conscious pride in their identity as a ‘North.’ Ad agencies advised, “you’ve got to own the cold,” and this Wall Street Journal article explores ways that Minnesotans developed products and media campaigns which, among other things, identify the cold as being a distinctive aspect of their lives, something they can focus attention on as a marker of what they value about their lives and their places. If Minnesotans can find ways to take pride in their weather – typically colder and snowier than ours – I hope that motivates us to salute what we have, too. Creative public art projects can also be a means of directing peoples’ attention to something interesting and fun during winter, rather than having them focus on frustrating aspects. That could mean a Wisconsin town developing a giant snowman sculpture, a new icon during winter for Minocqua. It could involve a Minnesota family deciding to, on their own lawn, create some pretty impressive sculptures (and to get their neighbors to assist as well). Wouldn’t we appreciate winter more if it meant that every block periodically produced entertaining new sculptures for residents to enjoy? If we took more time to be creative? A particularly fun example from this winter came from an Allouez woman, who decided to wear a costume based on a “Rudolph the Red-Nosed Reindeer” character while walking her dog. This small act – which we could call a hobby, or performance art, or who knows what! – drew a lot of media attention. Neighbors could be entertained by something fun; and newscasters could focus attention on the lighter side of winter. I appreciate seeing a variety of different articles sharing some of the beauty that we can find in winter. My favorite recent pieces show that winter’s beauty can be found in nature, in art developed to make use of snow, as well as in the ways that elegant human architecture can inspire us through the harmonies it can develop with different kinds of weather. Earthporm collected, and reflected on, some of the best examples from around the world of the striking patterns we can find in snow and ice. Simon Beck is one of the artists who most effectively uses snow as a medium for his art, tracing fractal patterns with his snowshoes. This Huffington Post piece provides a good introduction to his work; a recent Forth magazine interview. On the other side of the spectrum, Architectural Digest reminds us that when we make beauty a priority in the design of our buildings, the combination can remind us of how effectively nature and culture can work together. On more philosophical notes, Wisconsin’s John Hildebrand, author of The Heart of Things: A Midwestern Almanac, shared reflections on how “winter night makes even the smallest chore expeditionary and the cold itself a destination,” in an essay which moves between reflections on walks in his neighborhood and tales of polar exploration. And Clark Strand, author of Waking Up to the Dark: Ancient Wisdom for a Sleepless Age, reminded us in a New York Times piece that there is a value, spiritual and otherwise, to the darkness during winter. Life offers us many opportunities, and making an efforts to access the gifts that come from such opportunities is part of the way to be happy where we are, during any season! It all started with one woman leaving her purse at a bar… and deciding to take an unusual route toward getting it back. 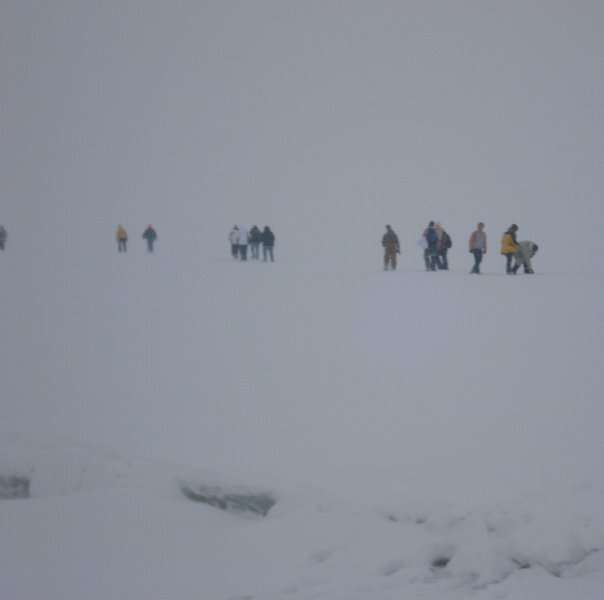 It led to, year after year, lots of people telling participants “you are nuts.” But last year, over 600 people decided to join in – to get up, head to a frozen lake in mid-February, and spend hours walking across it! I had the chance to talk with Stacy and Jordan Frakes about the history of this new tradition. 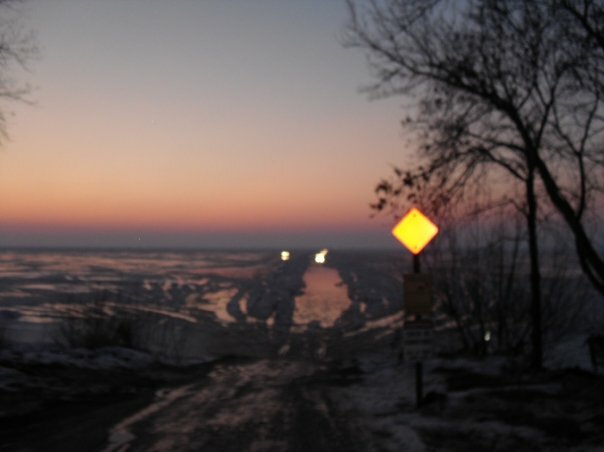 In 2003, Stacy Frakes lived on the west shore of Lake Winnebago. Like many others who lived on the lake, she was used to a local culture where socializing often revolved around the lake; visiting bars on the lakeshore, boating, fishing. 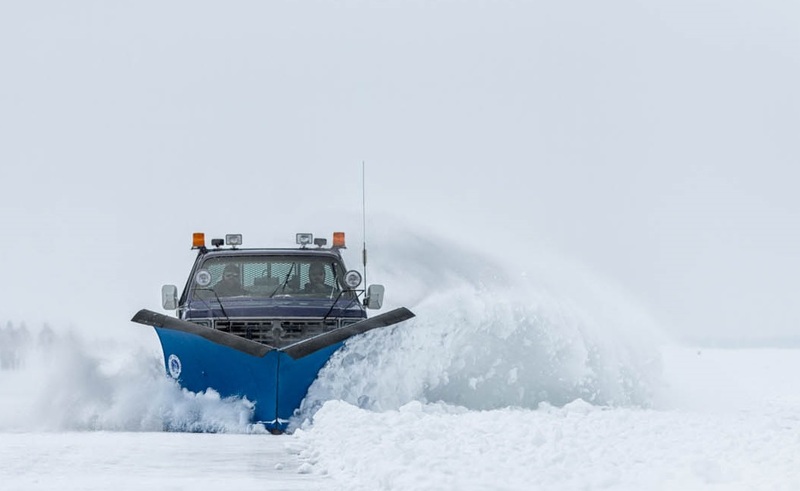 And during winter, snowmobiling, and driving on the lake – odd as that may seem to people in other parts of the country, it is a regular part of the culture here. (Particularly on Winnebago, where sturgeon-spearing season is a winter highlight). One Saturday night, she left her purse behind at Gobblers Knob in Stockbridge… across the lake from where she lived. For whatever strange reason, she decided to get it back by walking across on that beautiful Sunday morning, and invited her friends Connie Schultz and Jamie Caldwell to join her. (And for whatever strange reason, the three of them decided to actually decided to go through with the plan!) ‘We’re comin’ over for a Bloody Mary,’ she told the bar… and then the three went on over. And this started a tradition. 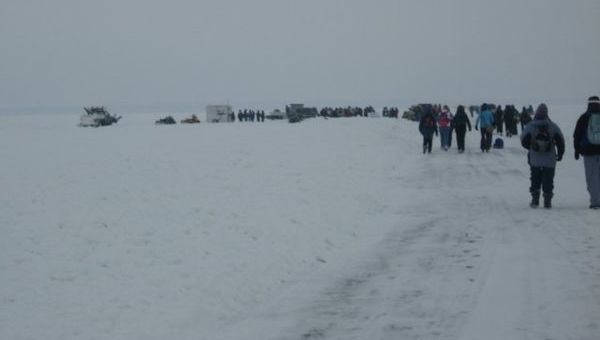 Now, Lake Winnebago gets heavily used in the winter. Trucks created informal paths across parts of the lake, and some people plowed paths to their shanties on the ice, so the ladies had trails partially blazed for them, even in the early years. Given the neighborly culture, local private organizations found their ways, over the years, to join in the fun as well. 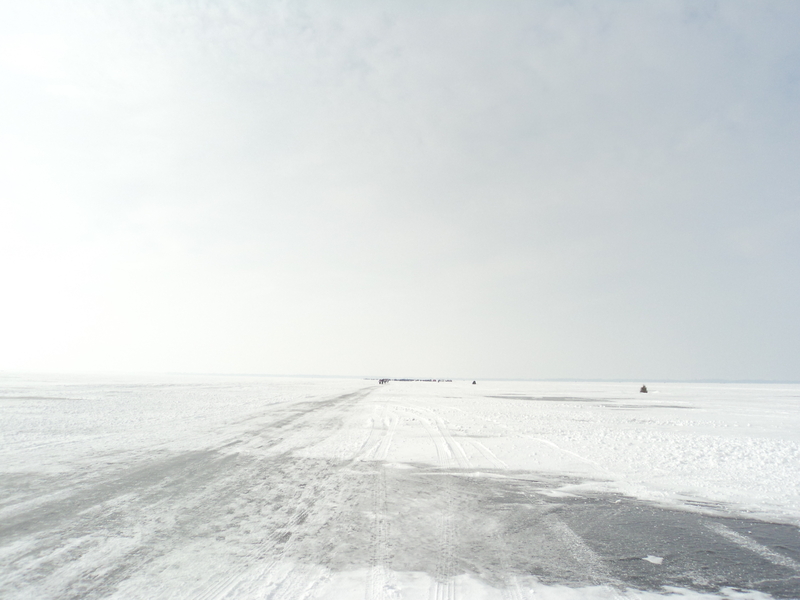 Paynes Point Hook & Spear Fishing Club, used to plowing routes on the lake for fishers, now maintains the ice-road for the walkers. 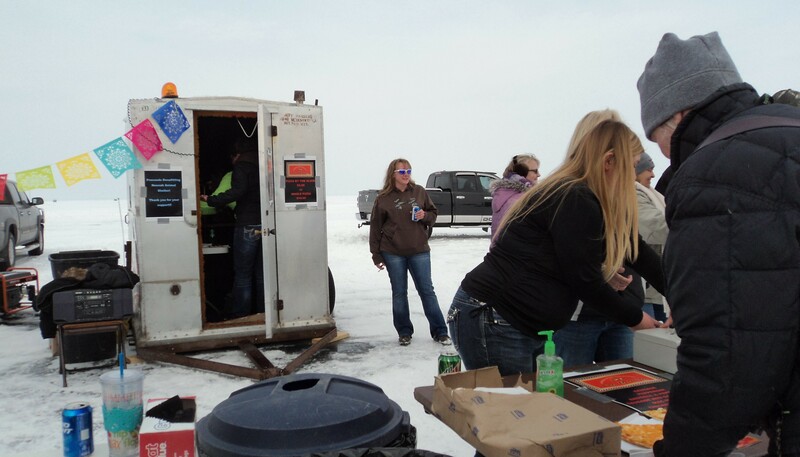 Each year, new friends, neighbors and local businesses try to find a way to join and support the event, including supporting social refreshment stops on the way across the lake. Representatives of Paynes Point Hook & Spear Fishing Club plowing a road on the ice. 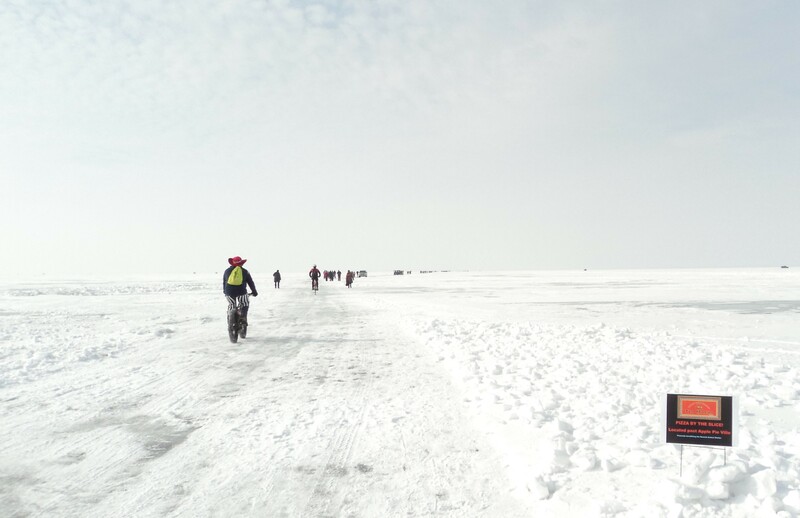 As one might imagine, an event premised on walking an extended distance, over what is essentially a level field, in the middle of February, can face challenges due to the weather. In 2008, a blizzard struck. Walkers had to rely on GPS and walkie-talkies to stay on track. The group wandered off course somewhat, which was frightening for some. One year, neighbor Karl Engling decided to have a ‘Margaritaville’ stand on the walk. But, given the weather, the drinks could freeze in straws. ‘We need warm drinks,’ they concluded. So since then, Engling’s ‘Apple Pie Ville’ has provided warm shots for people midway across the lake (or on the shore, during the years no walk was held). Others have joined in at other spots, with their own drink offerings. Walkers suggested that if they were going to have an audience involved in such an activity, why not use it to raise $ for a cause? (Or, more light-heartedly, ‘we wanna do this dumb thing for them’ 😉 Since Frakes was on the board of the Neenah Animal Shelter, that was a natural choice as a cause to support. So from that point on, the Walk Across Lake Winnebago became a charity event as well, raising over $6000 in 2014 for the Neenah Animal Shelter and for Menasha’s K9 Unit. At the time of the first walk, Frakes had never heard of anyone else walking across the lake (although she later heard from someone who had done so). Drive, snowmobile, sure – but walk? People thought they “were absolutely nuts.” But take a few people who are nuts… have them apply some gentle peer pressure to others, perhaps via tagging people on Facebook… and whaddya know, more join. And, this being Wisconsin, if you have an event where people can have a Bloody Mary before they start, supporters set up stands with drinks available along the way, and you have people bringing sleds to haul beer on; well, it becomes another reason to drink and be social (think of the spirit of tailgating, but with exercise added… ) The Walk became something to look forward to in February, a chance for area people to come together. And you end up with hundreds of people are being nuts together! 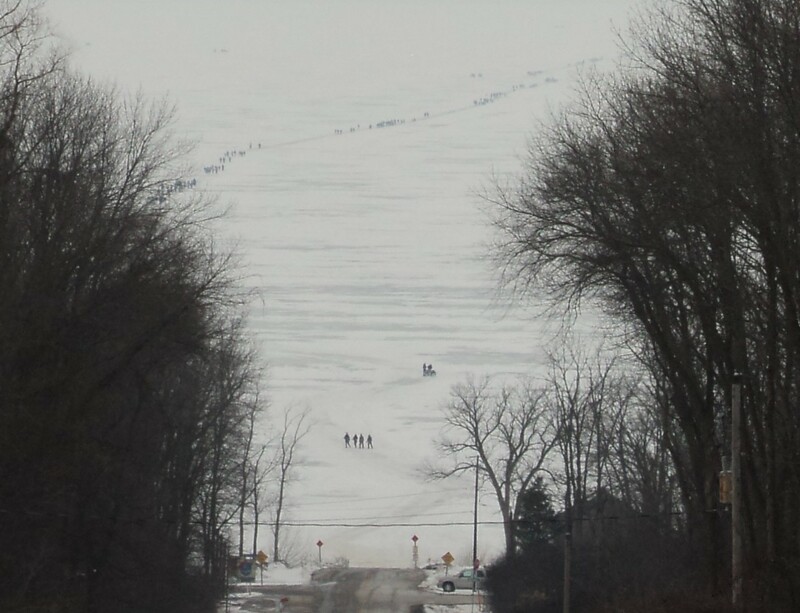 It may be cold, it may be February, it may be strange – but they have a good time doing it, and I had a good time joining in last year (see https://milwaukeesnow.com/2014/02/03/walk-across-lake-winnebago-impressions-from-my-first-time-crossing-the-ice-2/) I hope you can join us if you’re in the area; if not, I hope you can find your own creative way to find outdoors fun this winter. Note: all photographs in this post courtesy of and copyright Jordan Frakes. On the other hand, once one’s eyes adjust to night’s level of light, these artificial lights can feel piercing, intruding. 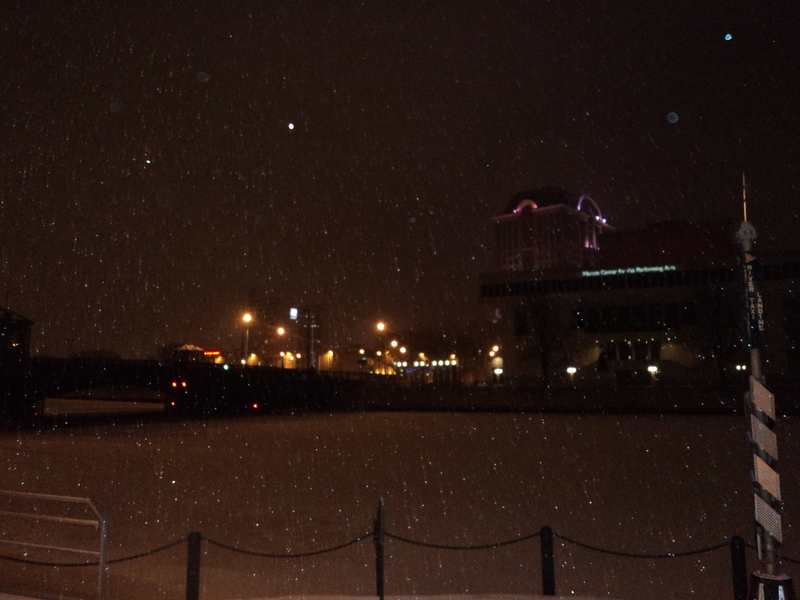 When snow is falling, the snow extends artificial light’s physicality in the air; it becomes a cloud, not just a beam. 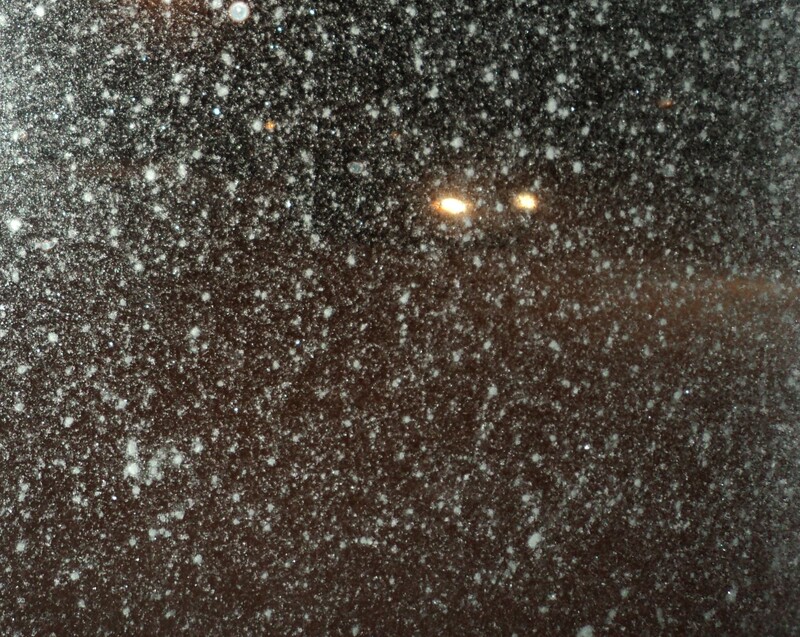 Falling snow also muffles artificial light; it no longer extends quite as far – it is held back to a certain zone, and then the falling snow beyond remains unilluminated. Light that once shot out, flying far across our cities, is now limited. I appreciate snow placing some temporary limits on the human ability to transform the landscape, letting me see more of nature’s power to shape. On a dark night, there is little I can see near me. 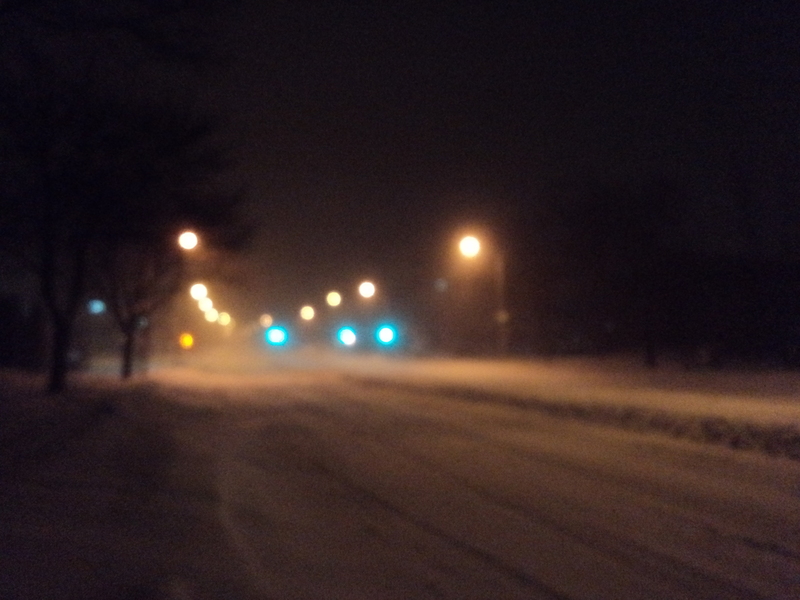 I am distanced, during heavy snow, by the fact that it will take me longer to travel to what I can see. The cold feels like it spaces me further; I am set apart, some presence holds me away from what I see. I am not quite part of this landscape. But I can go out and be amidst it. I step, step through a snowy field in a local park. Do I watch my shoes? No, I don’t really have to. I am apart, walking across a field. Movement through snow is difficult enough that small spaces provide more of an exercise, experience, perhaps even adventure. I remember to look around, see what I can. 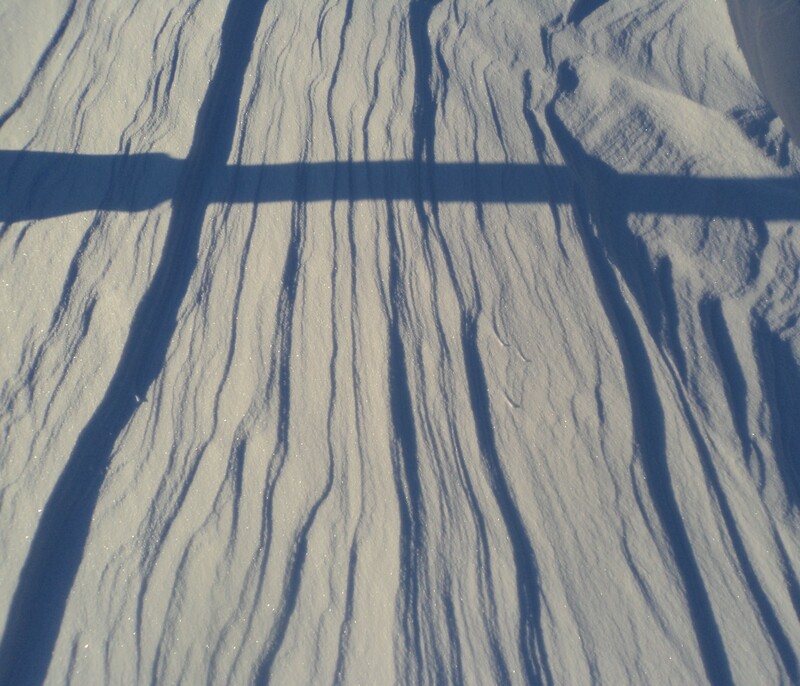 Some areas are lit by lamps – here I can really look at snow, sometimes clean sheets of it. Then I move back to the dark, where I can barely make out dimly-lit snow. I have pleasant surprise of coming upon drift patterns that had been hidden. I knew basically what would be there, but I had to wait to find out in more detail. The adventure of not quite not knowing what would come up next. Winter is my favorite season during which to look at the ground floor at night. With the snow out, there’s a layer of something light, a layer of contrast. 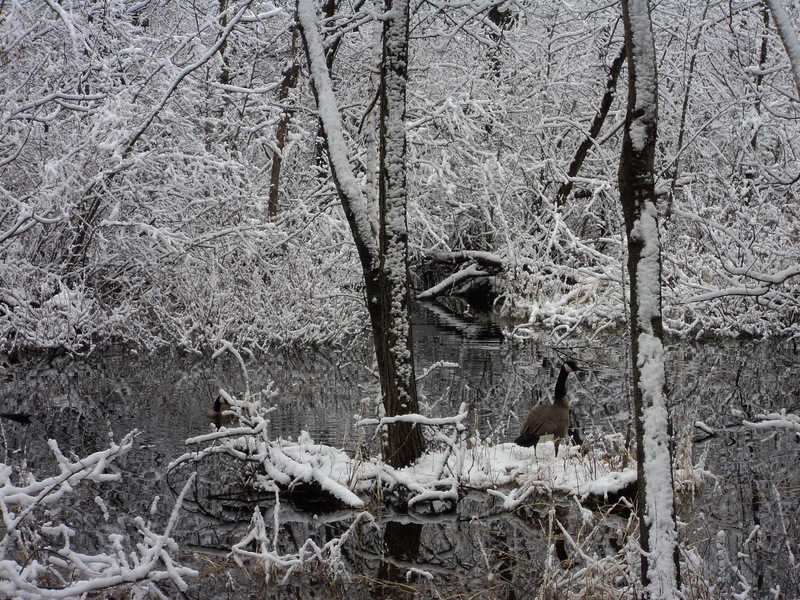 I find the snow calming; and it provides contrasts to what is above it, trees and more. When the moon is near full, there’s a fair amount of illumination. It is more delightful when snow is on branches, but there’s some luminosity to enjoy whenever there’s snow on the ground. A great opportunity to experience the winter glow. Or, to spend time looking out your window, not just into the normal dark, but now into contrasts you can watch all night. When I get outside, at first, I have a sense of moving into darkness. Being in a lit house or car means relying on bright artificial light; as one drives, natural areas just look like spots of darkness, because one’s eyes are adjusted to watch the brightly-lit areas. It takes a little while, but not long, to adjust, after one starts walking. Then I have a kind of moment of discovery – whoa, look how much I can see here! – and a kind of pride and appreciation for the light. Even in a forest at night, there’s more light than one would expect beforehand. With snow to help distinguish trees from the ground, one feels surprisingly comfortable finding a way. One can enjoy the sparkling of snow hit by moonlight, and more. In a local nature center, there’s a cleared path, with some snow on it, and trees are cut back from the side of the path. So I can easily see where I’m to go, since there is a stretch of white openness to follow. (In fact, it may be easier to notice the path at night; the shades of forest blend to together into darkness, while the cleared area sticks out.) Particularly since my attention is drawn down, both to watch my footing on any icy path, and because that is where I can see. Looking straight out at eye level, there is darkness, since the presence of trees in the forest thickens into something one cannot see into. Looking down, one can see the forest floor extend for a certain distance – and nearby, there are bright spots. In a field, I sit down. With my face close to the ground, I can see more tiny reflective sparkles. Around me, the snow does not glow – but I am clearly amidst a sweep of land that can be seen, surrounded by a darkness into which my vision cannot penetrate. The border appears sharp from a distance, particularly because it feels as if everything I can see along a horizontal axis is white, while everything along the vertical axis is dark. But closer up, there is no easy border. 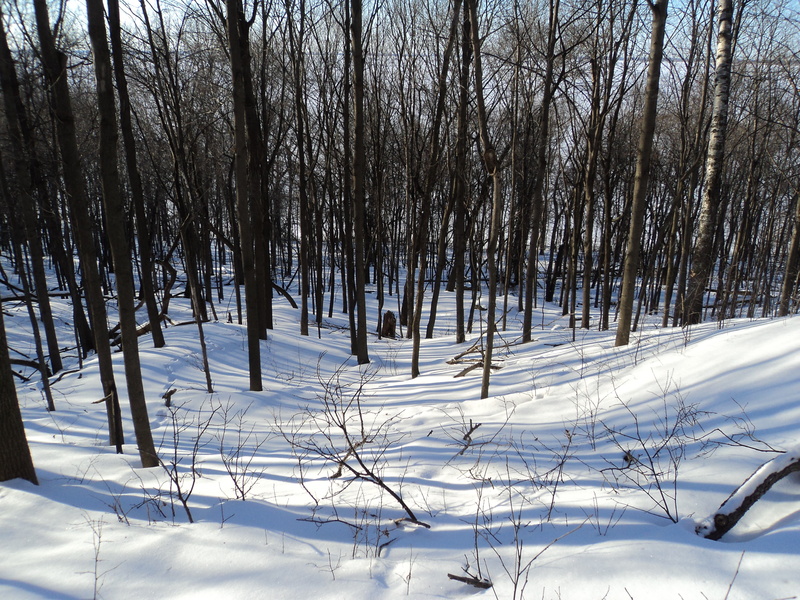 On the snow, the shadows of trees reach out, to where I can walk over them. 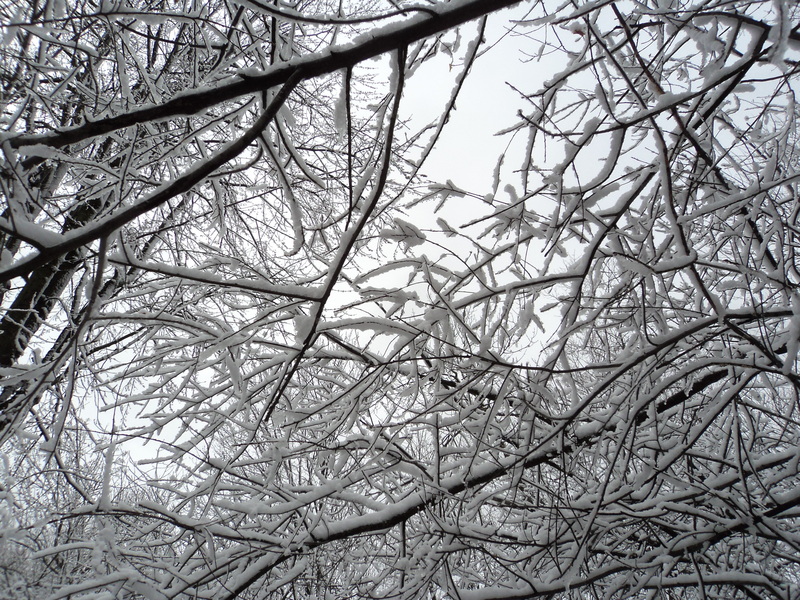 Looking up, the trees are hard-dark against a dark-grey sky, but the branch patterns are more easily visible in these shadows on the snow. On the other side, the forest floor sets itself apart in a way it normally doesn’t, as a pallid sheet. The brightness of snow at night has been used to good effect by pop culture – scenes of sleighs at night, George Bailey running through downtown Bedford Falls, the “Let it go” sequence in “Frozen,” and more. 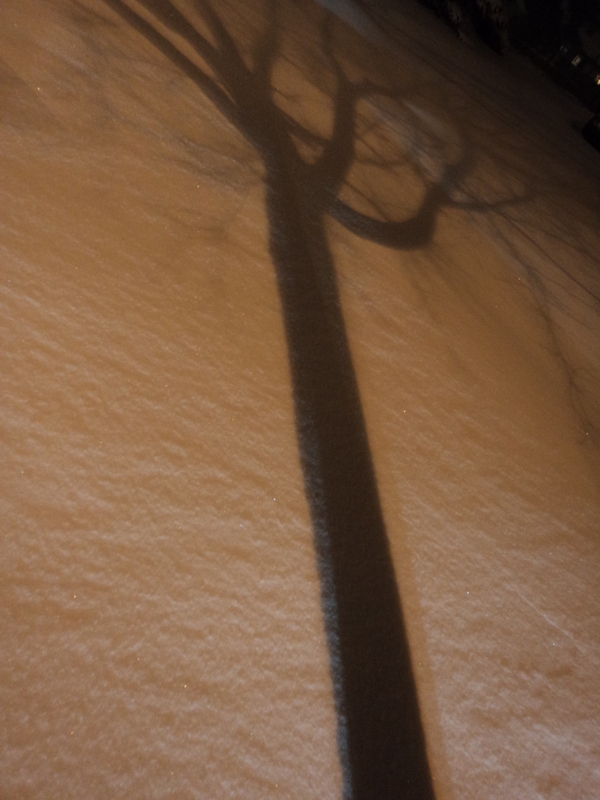 I’m not quite sure how to best describe the reflectiveness of snow at night. It is not quite a glow, or luminescent, or glistening. (I’m still working on the best word to choose…) More a dull… presence of white, which doesn’t really extend beyond the snow itself. The light isn’t that powerful – but the contrasts it sets up are! This is not the bright snow of the day, which has its own pleasures. Nor is it like a dim day, where the sky is grayish, and the snow feels that way too, and they blur together more. There is a sharpness to a clear night under a full moon. The trees lose the color they have during the day – beyond the nearby, they become shadows and dimness. There is little to see in distance in forest, or in air around you, or in sky. Amidst that, something sticks out: the snow may be dim, but it is starkly white. The shadows cast by the moon cut boldly across this. So the observable world becomes narrowed in focus – the shadows, and the dim white snow. Today presented an unusual treat. 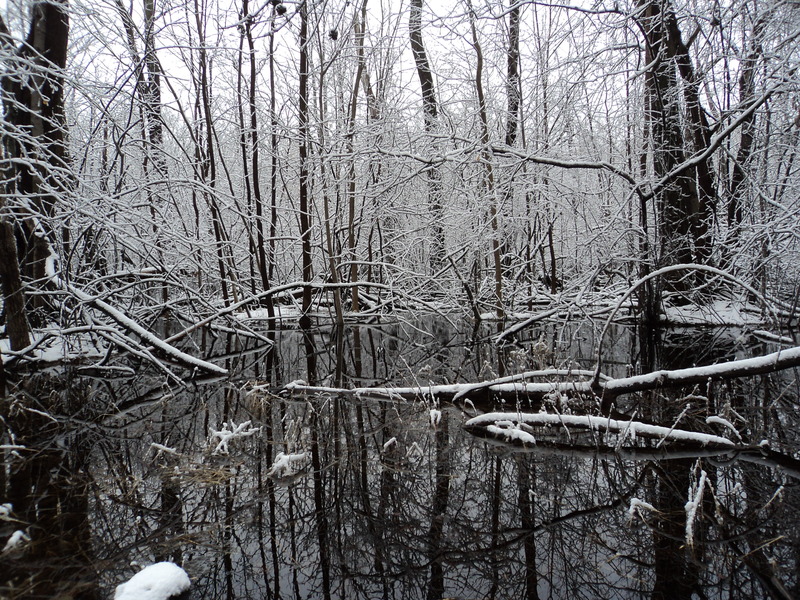 Previous snow cover had melted, followed by some big rainstorms, meaning that in the wetland near me, water covered much of the ground. 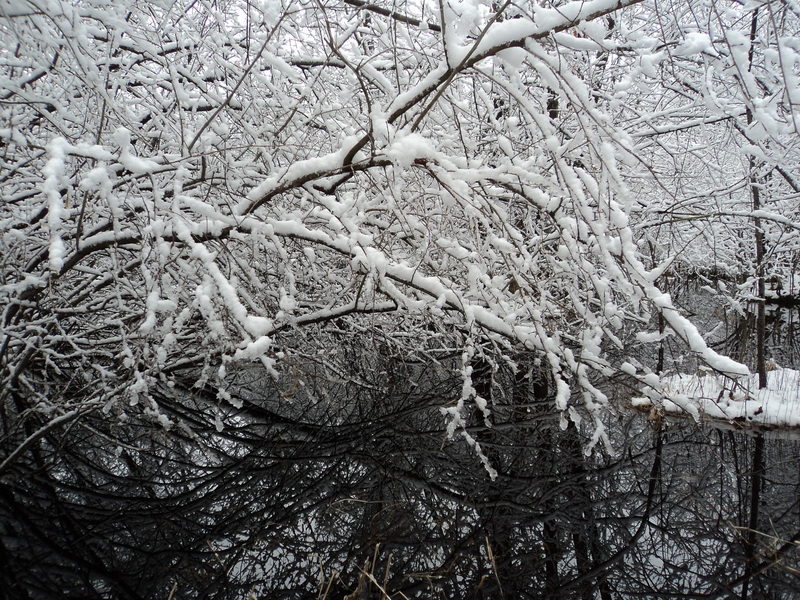 Last night, we got one of the best snows to appreciate afterwards – snow that sticks to trees. Today, the weather was cold enough that the snow didn’t melt quickly. 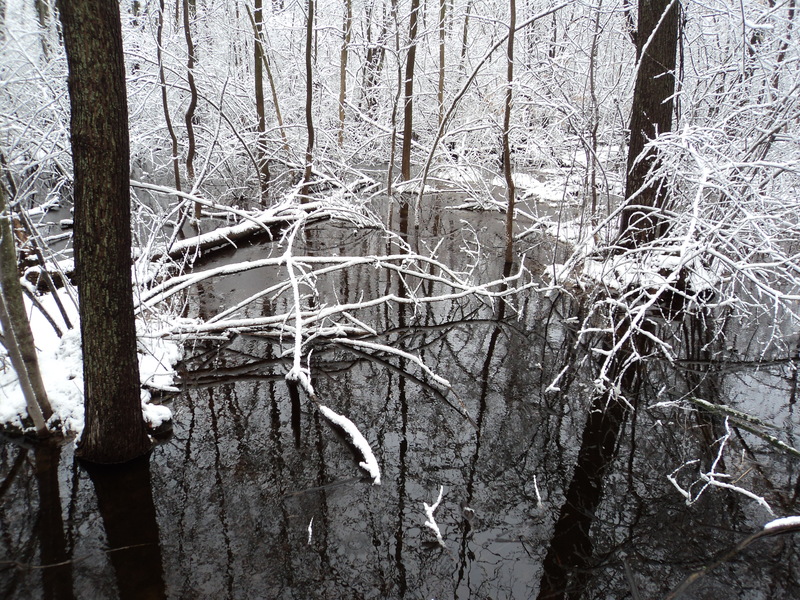 Add that up, and there’s a rare opportunity: to see snow-covered branches and fallen logs, plus snow-sprayed tree trunks – above a wetland which provided a striking contrast as the ‘floor.’ No layer of white below the trees – instead, a reflective, bluish surface. This is a pretty rare combination. This provided a nice means of setting off the whiteness against a backdrop of other colors, to help the snow stick out more. The animals I saw out seemed to have adapted to this world of snowy islands. See below for more of a sense of the ‘islandness’ of the scene. Late March where I am, this year, means one can experience this combination: 1. Spring-like weather warm enough that I don’t need bulky winter clothing anymore, plenty of sunshine, and birdsong 2. a winter-like woods where the floor is mostly covered with snow 3. the sound of rushing water (in a park which doesn’t have any rivers or streams normally). Lovely that I can experience all that at the same place and time! 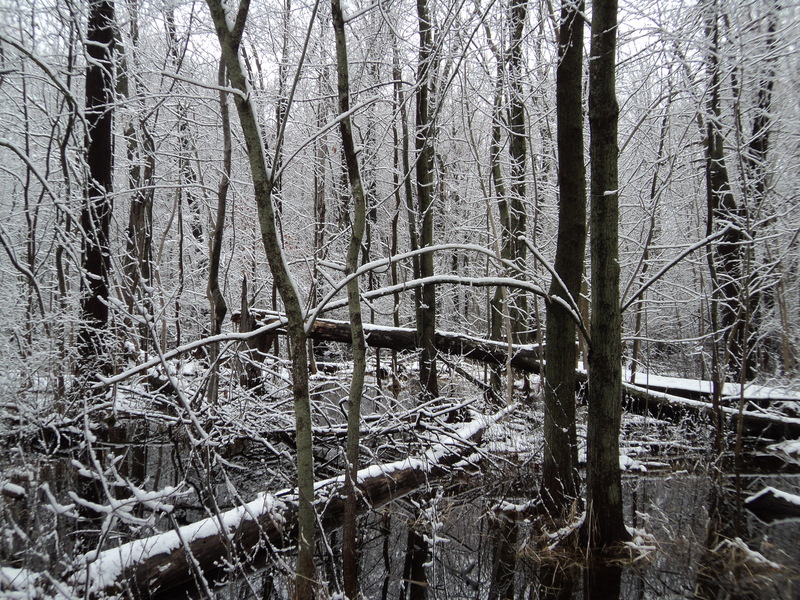 The forest floor was mostly covered in snow, but most objects above no longer had snow on them. Plus, near trees and in some other spots (in patterns that were erratic), I could see piles of leaves. So this was a landscape in white, grey (shadows) – and lots of shades of tan and brown. (Plus just a touch of dark red.) 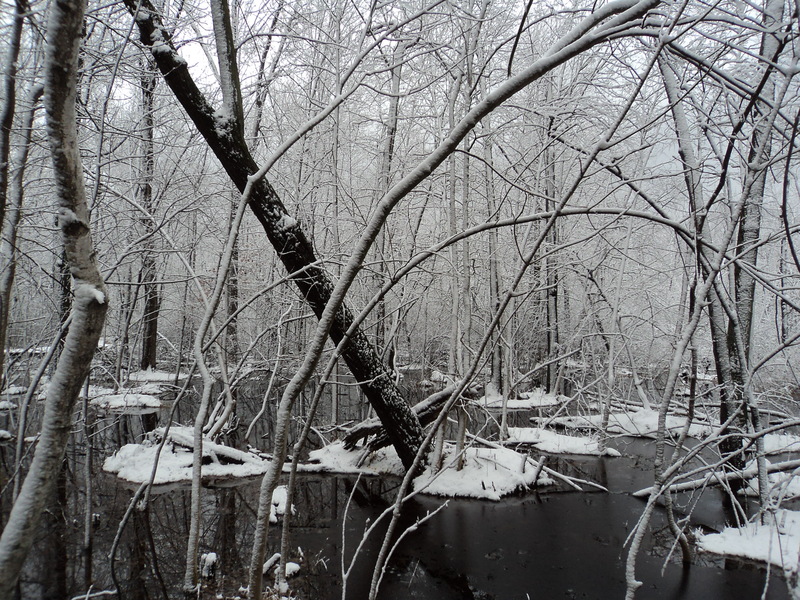 Such woods – which of course once covered some of the land where cities and towns now reside – demonstrate to us what snow-melt patterns might have been like in our areas before we removed the trees (and changed climate patterns, of course). 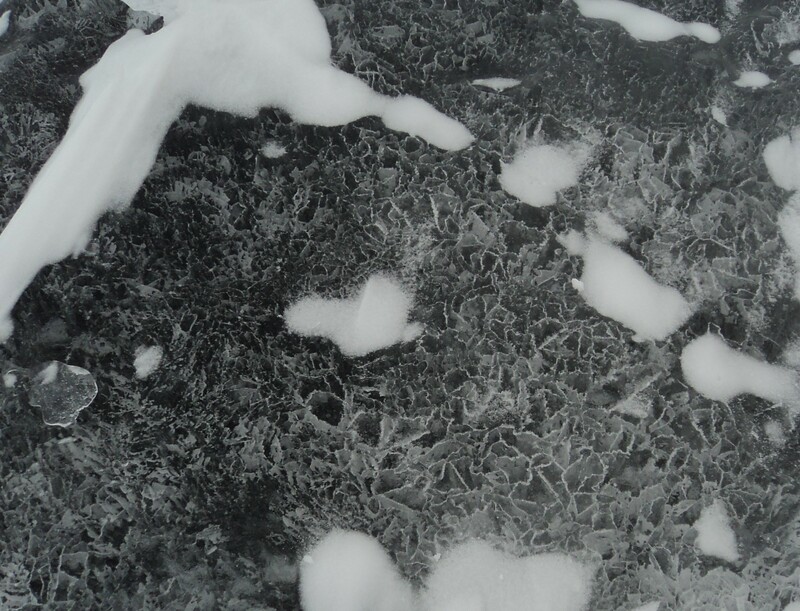 Perhaps the most striking feature was the melt patterns. 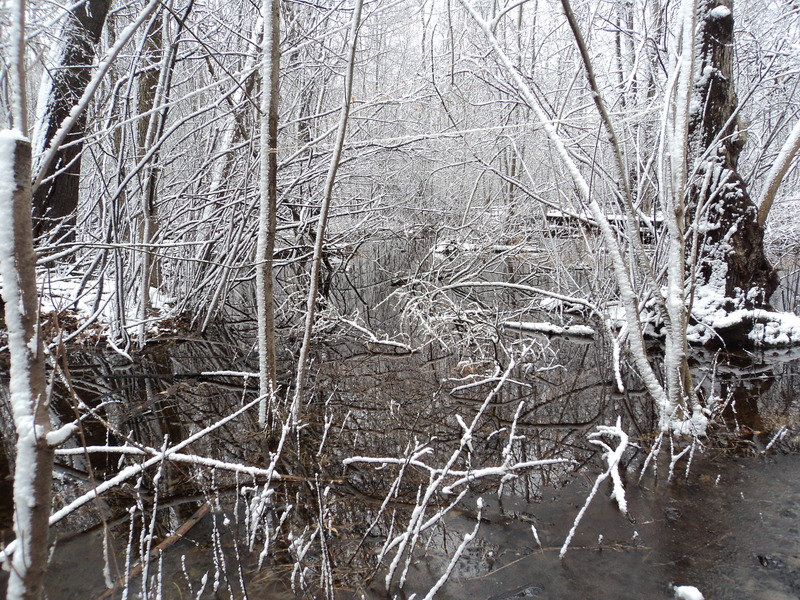 Little streams of water rushing down the slope sometimes appeared underneath the snow cover – and at other times remained under. It looked as if the tiny streams had eroded channels, smoothly, down several inches or more (I don’t know if that’s what actually happened, but that’s how it looked). Some of those had turned into ‘dried-up stream beds,’ as channels shifted; a place where water once pooled up might now be dry. (Well, dry except for the frozen water bordering it.) This is a landscape constantly shifting and transforming. In other areas, there were small-scale regular patterns that were striking to observe (and difficult to appreciate on film, alas) which looked like nothing so much as slight ripples on a pond, frozen in place. A nice case where the visual metaphor reminds us of what the substance is: water! Lake Winnebago looked wilder today than it has for much of the winter. The shanties, the cars were no longer present out there; it no longer looked like an area that humans had staked out roads to make use of. (I did see and hear one vehicle, an ATV I think, heading across.) And I think it *is* wilder at this time of year than at others, in a sense. Americans like to define and control nature (particularly dramatically in the case of wetlands). But this could not be fixed as ‘ice’ that one could drive on, or ‘water’ than one could boat on. It was not securely one or the other. The tracks of snowmobiles, the roads on the snow, were only barely visible at this point; as the snow melted, tracks faded. 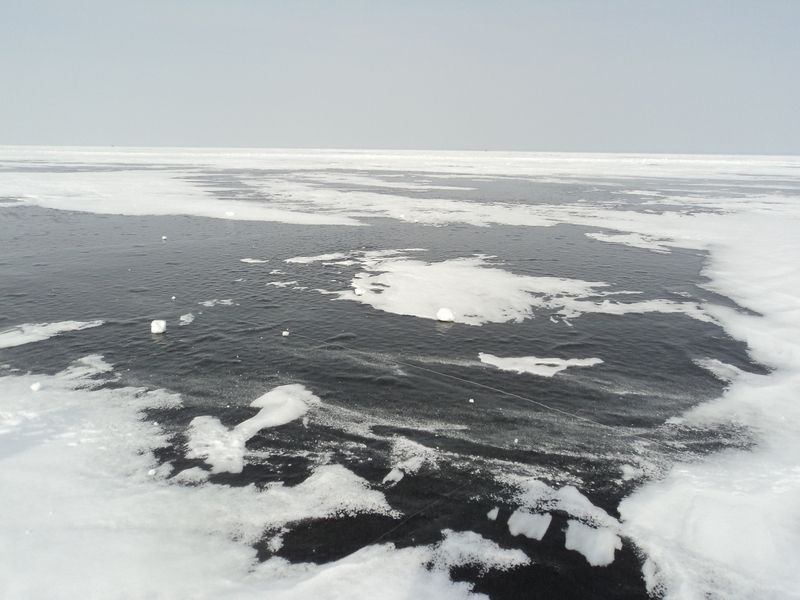 Those signs of human management of the ice made sense when the ice was more solid, but (with appropriate symbolism) have been lost as the ice returns to looking more like a wilderness that humans must think carefully about how to use (or avoid until it is safer). The whole experience reminded me a bit of the time I’ve spent in the summer visiting glacier ice; the mix of warmth, snowpack, and melt-rivers. It was amusing here in Wisconsin (and perhaps a little dangerous, I admit) to be walking above flowing water (usually, on ice less than a foot above the surface). The remnants of snow in most areas might be decisively human-shaped (the dark piles around parking lots). But one can head to the woods to see natural elements at play, melting and flowing in a series of patterns that change quickly. Streams, trickles, snow, ice – where these are is in constant change, in what might be the period of the year with the least stability and the most variety. See what it has to offer today! As we exit the three coldest-average-months of the year (or ‘meteorological winter’), I will begin to wind down my promotion of winter appreciation for the season. Now seems like a good time to reflect back on what I have observed during this winter, and what this winter has meant to me. I launched my project in December 2011, so it was rough to have so little snow during the first year of my project! Remember that in 2012, Milwaukee set a record for its longest stretch of days *without* snow cover, so our current streak of almost 3 months with snow cover has not quite balanced that out. The last two winters have been ones with more to offer a snow-lover; it had been a while since I’d seen a winter where as much snow was left around as last year’s, and the colder temps this year have limited melting even more. Despite the winter drama, this doesn’t feel to me like a winter where we get big blizzards; or if we’ve had them, I haven’t been able to get out during most of them. Instead, we’ve had smaller storms, but on a regular basis. And more notably, the snow has only melted a little, so that it stays in place – indeed, it keeps building. 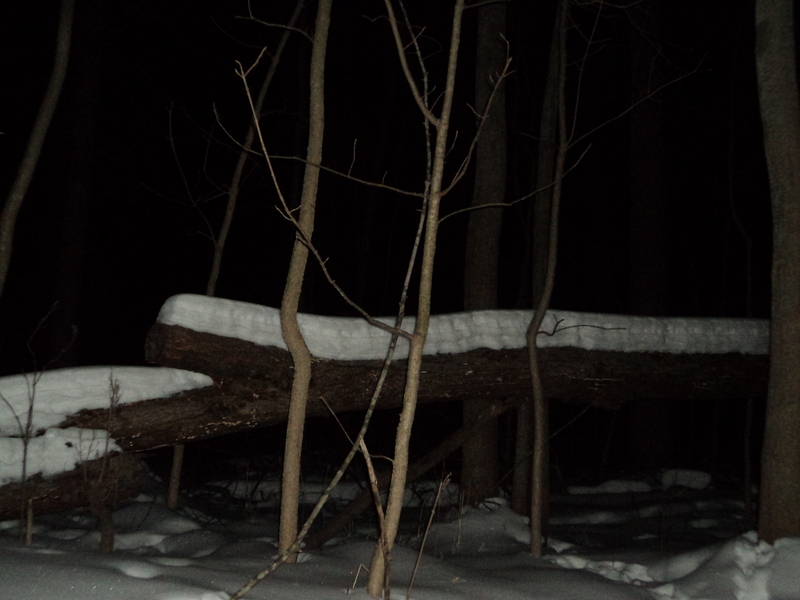 So it is nice to have horizontals, especially fallen trees, so can get sense of how much snow has fallen. 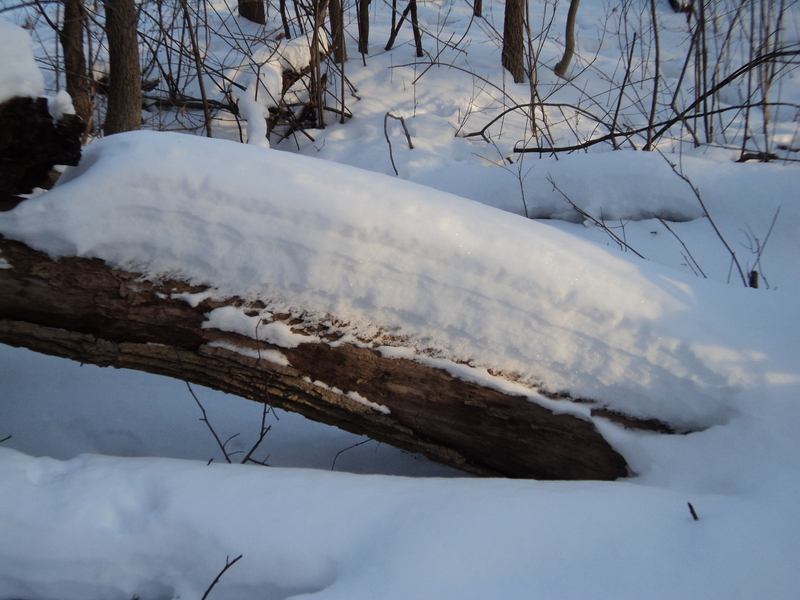 I can see how much snow has piled up on a log lying sideways, and then remember how much snow lies over the rest of the ground. I have realized this year that my impressions about winter were shaped by winters with snow-and-melt cycles; and I need to recalibrate some of my perspectives. For instance, I had assigned snowstorms a larger role in ‘where snow appears’ than makes sense in colder winters. I get excited to see snow layered on branches, which might be particularly memorable for a day or so after a dozen snowfalls or so. But that’s only a relatively small part of what snow is during a colder winter. When the snow doesn’t melt soon afterwards, it means that a larger % of snow-as-experienced is snow that sits on fields and in piles, week after week, fairly similar. Since the places it sits are fields and piles, persistent snow tends to be mostly fairly close to the ground. Landscapes without architecture tend to feel like cream-layered places on the ground and near it; snow piles up on low-to-ground on objects, it sticks around longer on broader, low branches. (I can see why might be a season more appreciated by children; since they are lower to the ground, they are more likely to feel surrounded by snow.) Meanwhile, dark trees dominate one’s view above a few feet (often with a backdrop of snow in the distance). Trees can blur into darkness; or, on sunny days, stick out as dramatic contrast to the snow, in this season of chiaroscuro. Also, in warm winters I had gotten used to seeing more change day to day, either from snowfall or melt (including how snowfields grow pitted). These changes happen more subtly when deep freeze seems to lock more snow in place. Some of them are harder for us to observe this year; when water off the shore of Lake Michigan stays frozen for dozens of yards into the lake, we can’t observe the daily changes on the shore I saw in past years. 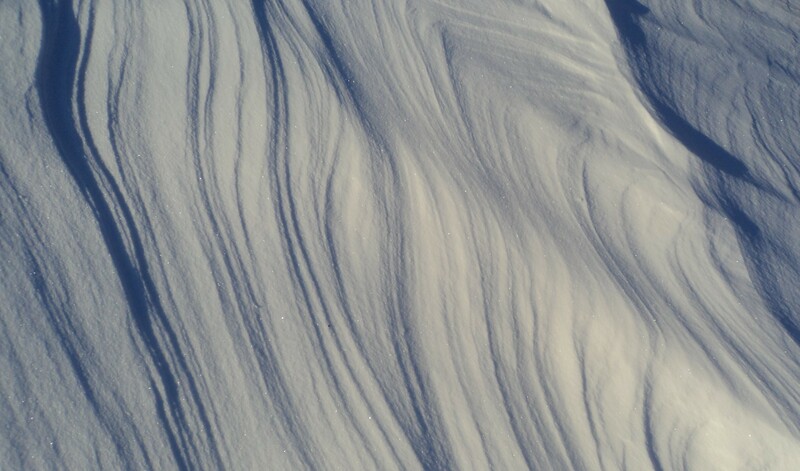 Nuanced changes in snow patterns can be hard to see, particularly on sunny days when the glare off the snow is bright. New snowfall isn’t as distinctive when it falls on top of a good layer of snow; it mostly just reinforces the existing view. Instead, I’m taking time to reflect on what it means to me to have, day after day, snow out my window to observe. To go to bed, leaving my window open so I can see that glow of white on the ground. To wake up and have bright sun and snow shining for me. A presence of unbroken snow in a nearby park to soothe me; a snowy field that gets periodically re-swept by new snow and by breezy days. And I knew that it would not melt, that I could return to it for consolation and good cheer day after day. I try to think of how to describe it. I think of the ‘warmth’ it provides to an otherwise darker landscape. It does that visually, but snow is cold, so that doesn’t sound quite right. I’ll keep working on my metaphors. The darkness is a gift of winter; while we rely so much on sight, being reminded of what we cannot see (see physically, and intellectually as well) is also important. A season when we use the dark is helpful for the mind’s palate, and can remind us to look up in the sky and ponder our place in the universe. In Wisconsin, this darkness sometimes comes paired with another gift; snow on the floor to match the dark in the woods and sky. Darkness, yes – but also striking contrasts, a hazy hopeful light that remains on the landscape’s floor at night, and more. It has been a while since I’ve had a winter like this. I’d forgotten what it was like. I have enjoyed the chance to see what it has to offer! And I will look forward to seeing what the other seasons have to offer, each in their turn. As we enter late winter, I thought now might be a good time to share some of my favorite essays about appreciating the season which were published this winter.